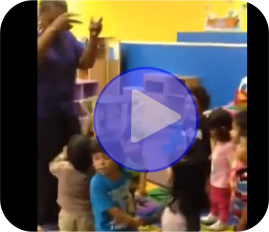 The two year old classroom has children ages 18 months – 36 months of age. The whole program at Super Kids Academy is a continuum, meaning learning begins from the time your child attends the center. Play, discovery, peer group interaction and exploration of the environment are key aspects to our curriculum which provide learning experience designed to develop the whole child. The two year old classroom consist of music, story time, outdoor time, games and starting to gain a sense of colors, numbers, shapes and letters.